You may not be the next Tiger Woods, but you can still take your golf game to new highs (or lows!) when it comes to improving your score with the help of a trained golf professional. When you invest in golf lessons, whether one-on-one or in a group or class setting, you can work to sharpen your technique and your skills, and hopefully you will find yourself playing even better on the course than you ever have before. The popularity of golf has grown in leaps and bounds since Tiger Woods joined the professional circuit, and today, more people than ever want to learn how to play this challenging, and also very rewarding, sport. Whether you are a new golfer who wants an overview on the in’s and out’s of how to play, or whether you are an experienced golfer looking for tips on how to shave points off of your competitive game, the odds are you will benefit from taking some private golf lessons, or at least from participating in a larger golf class or golf school setting. While you may watch the top golfers on television competing in major tournaments held around the world, they represent only a small, and very elite, portion of the field. Many other professional golfers compete in local tournaments and spend the rest of their time teaching others the nuances of the game. You can find these teaching professionals through golf courses, golf schools and even offering lessons through some local driving ranges. Many golf instructors have been trained by the Professional Golf Association (PGA) or have completed a similar golf certification course. An article in Golf Digest several years ago estimated that as many as 32,000 golf courses exist in the world, and half of them are located right here in the U.S. With so many venues out there, that means that likely there is at least a golf course or two (or maybe even more) in close proximity to where you live. That’s a good place to start if you want to get some extra help with your game. You can also look in the phone book for local golf schools and driving ranges that offer golf lessons. While taking these lessons doesn’t come cheap and often also requires a real time commitment, the investments can be well worth it if it helps you to play more competitively. If you want to sign up for golf lessons, it helps to start by having a budget in mind and an idea of how much time you will devote to this endeavor, since lessons come in many formats and sizes. You can commit to personalized lessons over a period of time, or you can take a class that spans several months, or even participate in a destination golf school/vacation. The choice is yours. Just remember that the more time and money you put into this sport, the more you can expect to get back out of it. Private lessons are a great way to work on your game and improve all aspects of it over time. Depending on your capabilities and experience, during a private lesson you might work on your swing, perfect your putt and practice chipping under different conditions. Some instructors also video tape players and analyze their swings to help them improve their play. Private lessons can be anywhere from 30 minutes to an hour, and they can take place as often, or as infrequently, as you want. The price can span a wide range, depending on the qualifications and experience the teaching professional brings, as well as the setting where the lessons are held. Exclusive private courses will charge more for lessons than a municipal course that is less expensive and more accessible to the public. For a private lesson with a golf professional, you can expect to pay anywhere from $25 for a half hour on up to $100 or more for an hour session. Some facilities also offer discounts if you purchase a package of lessons (typically six or more) and pay for them up front. (For instance, you may get six lessons for the price of five if you pay for the total session in advance, or perhaps 10 to 20 percent off of the total.) Keep in mind, though, that there is often a time limit within which these lessons must all be used, so find out up front what conditions apply and make sure you can commit to the terms before you go this route. It is also worth pointing out that some lessons may include the balls you use during the lessons, while other golf courses require participants to purchase a bucket of balls. This varies from place to place. Some teaching professionals also offer group lessons. The key to these is finding a group with other participants that are at a similar ability level as you are so you will get the most out of the time you spend together. You can take a group lesson with just one or two other people or can opt to be part of a larger group or five or six people. The more people you have in the group, the more time you can expect to be spent on more general information and the less time that will be focused on your specific needs and skills. That being said, though, it can still be a very valuable experience and is a less expensive way to go. Group lessons generally cost less than personalized training, since several of you are contributing toward the cost of the instructor’s time. Group lessons can be about two-thirds of the price of private sessions. For instance, for an instructor who charges $50 for a private lesson, you can expect to pay about $30 for a larger group session. Like individualized lessons, people generally take group lessons on a regular basis. (Such as once every week, or every other week, over a six month period.) However, it is worth noting that some people sign up for individual or group golf lessons to address one specific problem (such as slicing their swing), and don’t care to continue once this is corrected. The benefit is that you can always opt for a refresher lesson every once in a while so you can try to maintain the progress that you made. This is particularly important to know this support exists should your problem return in the future. Most individual lessons take place on the driving range or the putting green, so you can work on different aspects of your game. But when you are ready to hit the fairway, you may want to consider investing in playing lessons. In playing lessons, you pay for an instructor to accompany you out on the golf course and give you specific tips on your playing technique and help you hone in your strategy. You can sign up for individual playing lessons, or share such a session with one other person. This later option isn’t a bad idea for several reasons. First, it helps to reduce the cost, since hiring an instructor to join you on the course can be expensive. Second, it is also good practice to play with another golfer. A typical 9-hole playing lesson on a private course can run you about $150 to $200 or more, while an 18-hole lesson can cost you $250 to $300 and up. For two players, you might pay $100 to $125 each for 9 holes, or $150 to $200 each for 18 holes. While this may sound pricey, you should understand that sometimes (but not always) your green fees are included in the cost, along with the compensation for the golf professional’s time. But every country club and golf professional charges differently, so never assume this is the case. Always ask up front so you will know exactly what you are getting into. Since golf course prices can range to under $50 to play on up to several hundred dollars or more, it all depends on the type of course and the qualifications of the professional who will accompany you. If you can’t make an ongoing commitment to taking golf lessons on a regular basis, the next best thing might be attending a golf school. Many golf schools offer short-term intensive programs or clinics that are held for a few consecutive days, so you get lots of information and training in a short amount of time. If you are interested in this option, look for a small class if possible and make sure you connect with the instructor so you will get as much out of the time as you can. Also keep in mind that since many golf school clinics are only a few days, this makes it easier to plan one in another destination. This is a popular approach many golfers take, combining vacation with a golf school, so they get away and also work on their game. The price for golf schools covers a huge range, since what you get can vary a great deal. At the lower end of the scale, new golfers may want to begin by attending a one day session to learn the basics of the game. 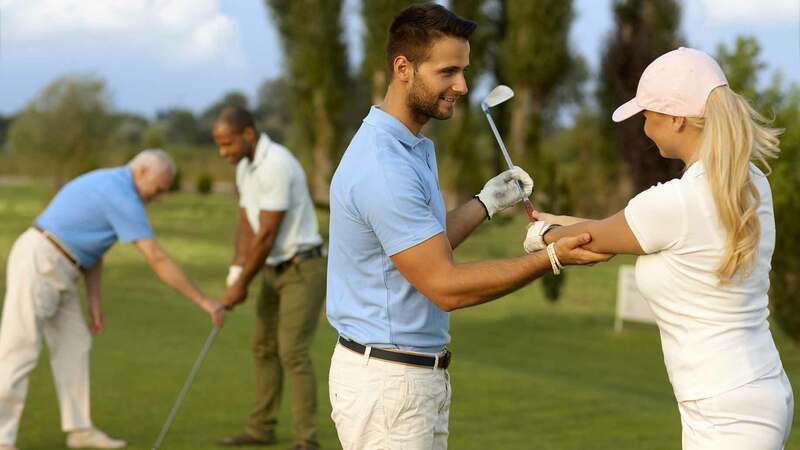 Since golf has a lot of nuances, this often includes the finer points of etiquette, dress requirements, safety tips and pre- and post-play expectations, in addition to the fundamentals of playing the game. Experienced players can also benefit from a more advanced one day session, which gives them an overhaul of their game and some tips to improve their performance. A one-day golf school can start at $250 to $500 and then go on up to from there, depending on where you live and who is teaching the course. Lunch is sometimes included. Two and three day golf schools are generally more expensive and many of them are destination getaways, so the cost of the tuition also may include lodging and meals as well as the instruction. (Airfare to the facility is usually an extra expense.) Also ask if you aren’t sure what is covered in the tuition cost. A multi-day (two or three) getaway golf school package taught by a PGA professional can start at $1500 to $2000 and go on up to $5,000 or more. There’s a lot in a name when it comes to golf, so some of the more famous teaching professionals are in high demand and can command higher rates. For instance, Tiger Wood’s coach Butch Harmon runs a training school in Las Vegas, Nevada, where you can expect to pay $5,900 for a three-day school with Harmon directly (compared with $2,900 for lessons with one of the other instructors at the facility). If you have unlimited money to spend on a weekend golf school, you may want to check out the Titleist Performance Institute in Oceanside, California. This high-tech training center, which caters to the wealthy and those who are serious about the sport, offers an extravagant two-day session starting at about $5,000. Or, you can spring for Callaway Golf’s VIP Experience, in nearby Carlsbad, California, which starts at $25,000 for a two-day getaway for amateurs who want to experience a dream golf training/vacation. This price includes accommodations at the Four Seasons, transportation in a stretch limo and a custom-fitted set of golf clubs. Two days at an exclusive training center can run between $5,000 and $25,000. If you don’t have the money to splurge on private golf lessons or golf school getaways, that doesn’t mean you can’t improve your game. If you are committed to improving your handicap without taking out a second mortgage, you might consider video golf lessons. For less than the cost of one private lesson, you can learn watch a slow motion analysis of Tiger and other great golfer’s swings again and again and try to incorporate the strengths into your own game.